Sometimes, subtlety is the way to go and other times, you’ve got to blow subtlety out of the water! Hey, when you’re Cleopatra, the Queen of the entire Nile, you can ride down the river on a raft full of servants that cater to your every whim. You can have lavish parties on a skiff. You can even eat ice cream for breakfast, because you’re the queen! And you’re definitely going to want to wear an outfit that has tons of gold and beautiful, bright colors. Now, your child can have the perfect outfit to assume her role as the loud and proud Egyptian Queen! 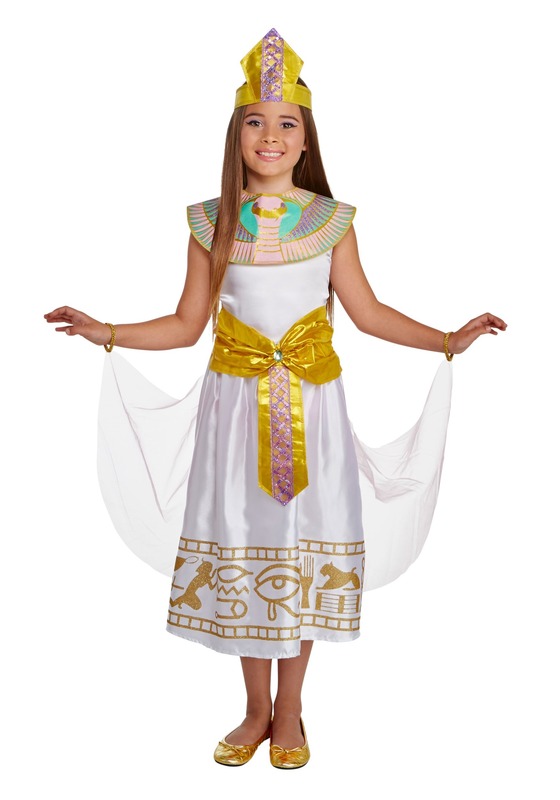 This colorful Cleo deluxe costume is a girl’s outfit that mixes ancient Egyptian style with a modern look to give your child the perfect look for her to become a queen! It has a white satin dress with sparkling gold hieroglyphics along the skirt. The costume also has a gold sash around the waist, which has sequins in front. The collar has a snake design with plenty of bright colors. The headpiece matches the waist sash and adds the perfect finishing touch to your new little queen’s look. It’s the quickest and easiest way to give your child a colorful style based on the historical Egyptian pharaoh. Once your child makes the full transformation, she’ll be ready to command all her loyal subjects! Just make sure to tell her to stay away from poisonous snakes, since we all know how that turns out thanks to William Shakespeare!